The Sikorsky H-34 (company designation S-58) is a piston-engined military helicopter that was originally designed by American aircraft manufacturer Sikorsky for the United States Navy for service in the anti-submarine warfare (ASW) role. It has seen extended use when adapted to turbine power by the British licensee as the Westland Wessex and Sikorsky as the later S-58T. Various H-34s served, mostly as medium transports, on every continent with the armed forces of twenty-five countries—from combat in Algeria, the Dominican Republic, Nicaragua, and throughout Southeast Asia, in roles such as saving flood victims, recovering astronauts, fighting fires, and carrying presidents. As one of the last piston-powered helicopter designs before its replacement by turbine-powered types such as the UH-1 Huey and CH-46 Sea Knight, it saw a total of 2,108 H-34s being manufactured between 1953 and 1970. The US Marine Corps has been selected to provide helicopter transportation to the US President and other high Government Officials. HMX-1 "Nighthawks" operate the Presidential helicopter fleet, which currently consists of VH-3 Sea Kings and VH-60 Blackhawks. Beginning in 1958, the VH-34D equipped the Presidential fleet. A plush (for the time) passenger cabin replaced the bare-bones troop seating with which other H-34s were equipped. When the President is aboard, any Marine aircraft assumes the callsign "Marine One". History adapted from Wikipedia pages. This kit comes in a fairly large box, and the sprues fill it almost completely. There is a small divider inside, which contains the clear sprues, and a couple of the smaller, more crushable sprues, neatly preventing the larger sprues from damaging them. 3 photo-etch frets and a large decal sheet complete the kit. Markings for a VH-34 and a utility CH-34 from the US Coast Guard are provided. Gallery makes extensive use of thin closed-cell foam wrapping to cushion parts of several of the sprues to prevent the more delicate parts from being damaged. The Main windscreen/cockpit roof clear part comes completely mummified in foam, and is therefore perfectly crystal clear and scratch free. Well done, Gallery! The fuselage is offered in left and right halves, plus an insert for the bottom below the cabin. The tail rotor pylon is separate, and may be built in its folded position. Inside, two complete cabin assemblies are provided, one with the luxury seating for the President, and the other a plain bare-bones military cabin for the Coast Guard option. The instructions do not specify what colours the cabin ought to be finished in. Reference photos will be helpful here. The etch frets provide sufficient seat belts for all of the cabin seats as well as the pilot seats, which is quite refreshing. In the cockpit, optional instrument panel faces are provided; one on each clear sprue. Decal instrument faces are provided, but they're printed such they they would be applied overtop the clear instrument faces on the panels. If desired, they can be soaked off their backing paper, and applied upside down onto a puddle of Future on the back of the instrument panel, after the front has been masked and painted leaving the instrument faces clear. The instructions are not completely clear as to which panel goes with which marking scheme. If I were forced to guess, I'd say that the more complicated panel is likely for the Presidential scheme. 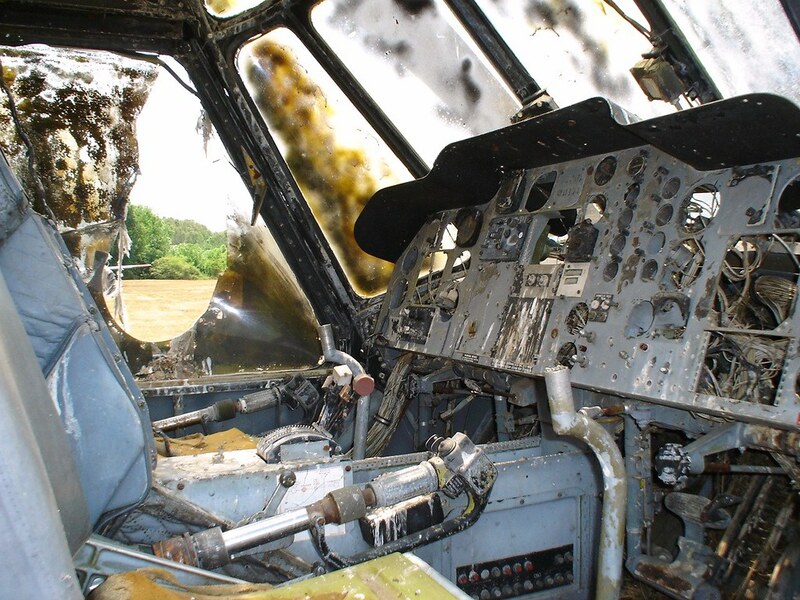 Frustratingly, the pilots' Collective levers are left out of an otherwise excellently appointed cockpit. They'll need to be scratch built. Luckily, they have fairly simple shapes and readily lend themselves to scratch building. They should be placed at the lower left corner of each pilot seat as seen in these photos Note that the Co-pilot's lever is much less complicated than the Pilot's. On the exterior, several extensive areas of mesh are provided on the etch fret, but frustratingly the model has these areas blanked off, which rather defeats the purpose of having open mesh in the first place. Junior modellers may simply paint these areas flat black, but more advanced modellers will likely want to cut these areas away to allow the light to shine through as it does on the full-size helicopter. A very nicely detailed Wright 1820 engine and its attendant cooling fan and shrouds fills the nose. The nose cowl doors are shown closed in the instructions, but it does not appear terribly difficult to pose them open to show off the engine detail. There is plenty of room in the nose to let the temptation for AMS to run wild with cables and hoses and all sorts of other widgetry which live inside helicopters. The main and tail rotors are made from separate blades which assemble to their respective hubs. There are some very fine plastic parts in these assemblies. Extreme care must be taken when removing these from the sprues if they're not to break. The H-34's tail rotor was fairly famous for looking "floppy" when at rest, so the separate blades are a bonus. In contrast to the optional folded tail, there is no option to portray the main rotor blades in their folded position, nor are the blade cradles provided. The blades themselves have a nice amount of droop moulded in. This kit only provides the "bent leg" style of landing gear. The struts look substantial and ought to bear the weight of the finished kit well. For those modellers concerned about this, Scale Aircraft Conversions offers white metal replacements. The kit provides representations of the stowed emergency floatation system. The box top illustration shows the system fitted to the main wheels clearly enough, but omits the rear fuselage float. The floats are shown in the instructions and the painting guides, but are not identified, which may confuse less experienced modellers. Being boxed as "Marine One", the first option is of course Bu No. 7191 in the characteristic green and white Presidential scheme. The second offering is an anonymous US Coast Guard helicopter in overall orange-yellow from an anonymous US Coast Guard unit. Colour callouts throughout are provided for Gunze Aqueous hobby colour paints. Conversion charts are printed on the paint guides for Vallejo, Model Master, Tamiya and Humbrol for the exterior colours, and more complete charts are available on the web for those modellers who use other paints. Highs: Very nice details, extensive optional parts. Lows: No collectives, no folding rotors, mesh defeated by blanked out kit parts. Nice. Another great H-34 kit. I really wish there was one in 1/35 tough. Hmm a marine subject with a splash of colour count me in, still need to get a US Navy version.